In 1858, the city of Melbourne was twenty-three years old and the colony of Victoria had been established for just seven years. The citizens of the colonies of Australia lived on the coastal fringes and the 'ghastly blank' that made the centre of this continent was unknown. Today we know more about the outer reaches of our solar system than the colonists of Victoria knew about the land north of the Darling River. The discovery of gold had made Victoria one of the richest places in the British Empire and the colonists wanted to show how advanced and sophisticated Victoria had become. A proposal was made to establish an exploration party to unlock the mystery of the arid interior. The reasons for this expedition were varied, a scientific expedition that would discover new species, new discoveries of gold and minerals, new and fertile lands for grazing, the extension of the boundaries of the small colony, the establishment of a telegraph line to London, the pride of being the first Colony to unlock the secrets of the interior; the reasons were many and varied. 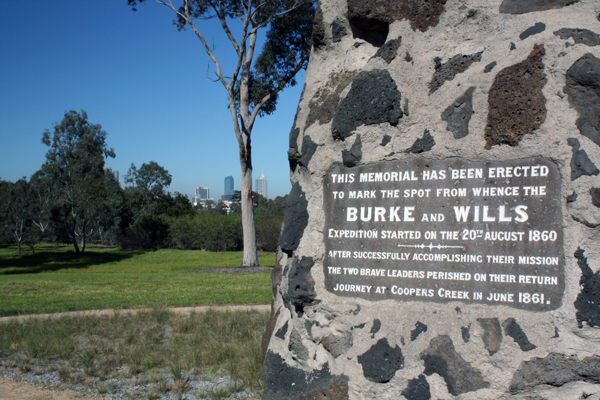 On August 20th 1860, this expedition left Melbourne for the Gulf of Carpentaria. The rest is history. Seven men died in the attempt at crossing the continent and little scientific knowledge was gained by the passage of the expedition. However to dismiss the affair as "ill-fated" is to simplify the complex reasons for the expedition and to ignore the incredible achievements and determination of the first men who walked across the continent.